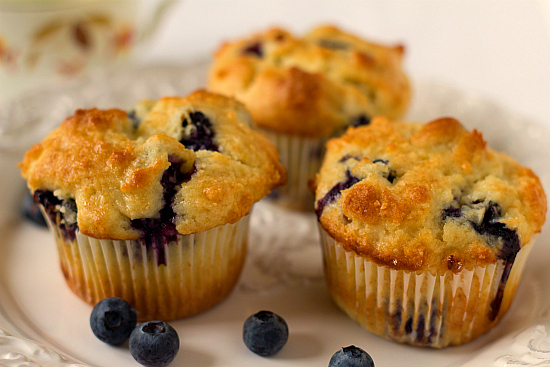 If you stop by our shop you're be able to sample our own Noho Blueberry muffins. But why not try to make them yourself. Here's our simple, easy to follow recipe. It makes 12 muffins. Preheat the oven to 190°. Line a 12-cup muffin tin with paper liners. Spray the pan and the liners with non-stick cooking spray. In the bowl of an electric mixer, beat the butter and sugar for about 2 minutes. Add the eggs one at a time, scraping down the sides of the bowl and beating well after each addition. Beat in the vanilla essence. Gradually add the flour mixture, alternating with the milk, beating on low speed to combine. Add the berries to the batter and fold gently with a spatula until evenly distributed. Do not overmix. Scoop the batter into the prepared muffin tin. They will be very full. When we were in New York one of our favourite spots for brunch was the Clinton Street Bakery in the Lower East Side. If you make it to New York, we highly recommend you visit them, but you will need to turn up early and queue to get in. We also highly recommend their scrummy blueberry pancakes. Here's the recipe from their cookbook. Separate the eggs, placing the yolks into a jug and the whites into a large, clean bowl. Whisk the egg whites using electric beaters until foamy then add the sugar and continue to whisk until you get soft peaks. Add the buttermilk, melted butter and vanilla essence to the jug with the egg yolks. Stir together. In a separate bowl, stir together the flour, baking powder and baking soda. Pour the yolk mixture into this bowl along with a third of the whisked egg whites and mix together until just combined. Add the rest of the egg whites to this bowl and gently fold in until no streaks of egg white remain. Pour a bit of vegetable oil into a frying pan, enough to just coat the bottom of the pan. Set over a medium-low heat and spoon in about ¼ cup of batter to form one pancake. Sprinkle with some of the blueberries. 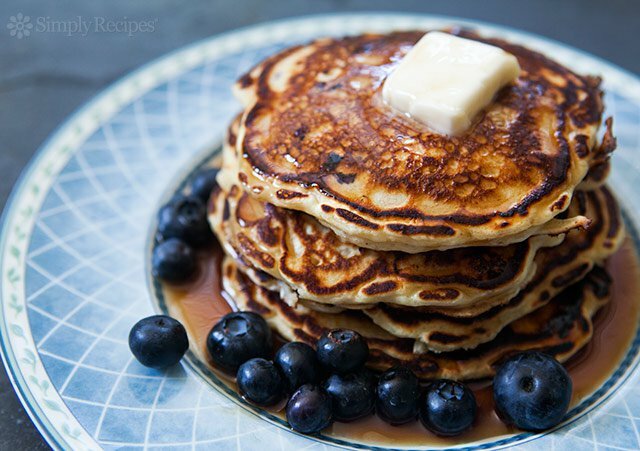 Repeat with more batter and blueberries so you have 3 to 4 pancakes in the pan. Leave to cook until the edges of the surface look set/dull and the underside is golden. Flip the pancakes and cook until the other side is golden. Repeat this until you've used up all of the batter. Heat the maple syrup in the now-empty frying pan (the one you were using for the pancakes) over a medium heat. Add the cold butter to the pan and heat whilst stirring until the butter has melted. Remove from the heat and serve warm with the pancakes. 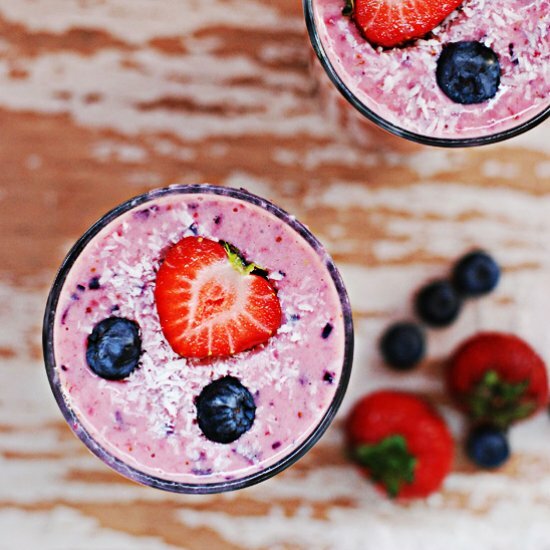 Nothing beats a smoothie particularly in the summer. They provide a wonderful combination of indulgence with an energy boost. They work well with frozen blueberries. Wash the blueberries and strawberries beforehand. Pour the water into the blender, followed by the banana (broken into a few pieces), and the berries, turn blender on. When all the fruits are broken down, add the chia seeds and apple cider vinegar, blend further. Lastly, throw in the ice cubes one at a time and whizz for a while longer. Before serving, steep the mint leaves in the smoothie for at least 5 minutes in the fridge. We lived in Summit a small town in New Jersey commuting into the city each day. New Jersey is the garden State that provides a nice contrast to the hustle and bustle of Manhattan. It is a far cry from a setting of The Sopranos and is in fact known as the Blueberry State of America. 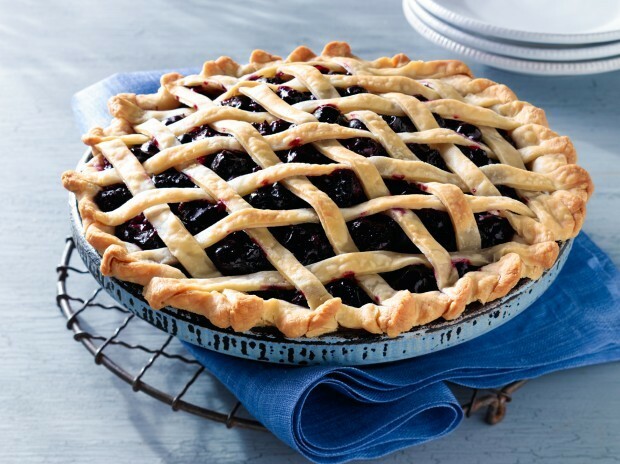 Here's a recipe for a classic American Blueberry pie you might want to try. Place blueberries in strainer and rinse. Drain berries and add to large bowl. Add sugar, a squeeze of lemon and a dash of salt. Pour berries into pie shell. Cut other pie crust into 2 cm strips. Place strips on top of crust in criss-cross pattern to form a lattice. Bake for 45-60 minutes or until bubbly. Our niece Leone is such a wonderful creative person and a genius in the kitchen. By the way she also owns a PYO berry farm in Greytown. 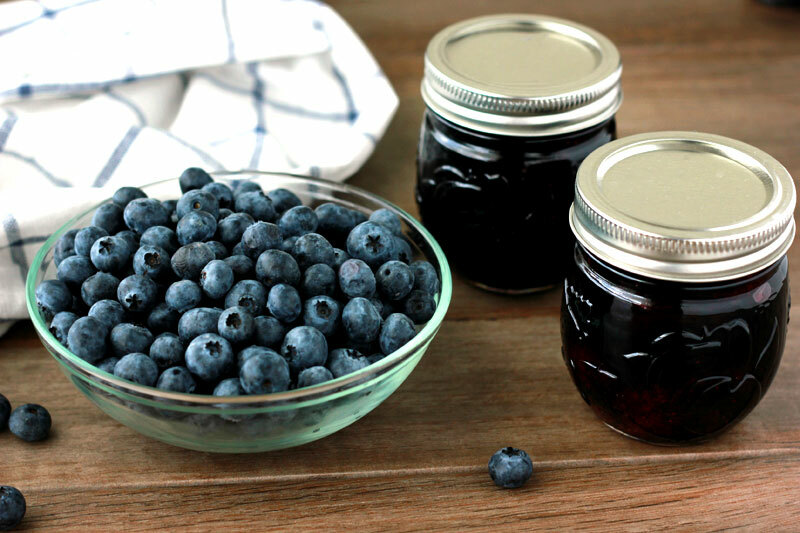 She concocted this blueberry lime jam recipe and so we just wanted to share it with you all. Add blueberries and lemon juice to pot and on a medium heat, occasionally stirring to avoid sticking to the bottom and burning. NB. Setting point will be different as batch sizes increases.